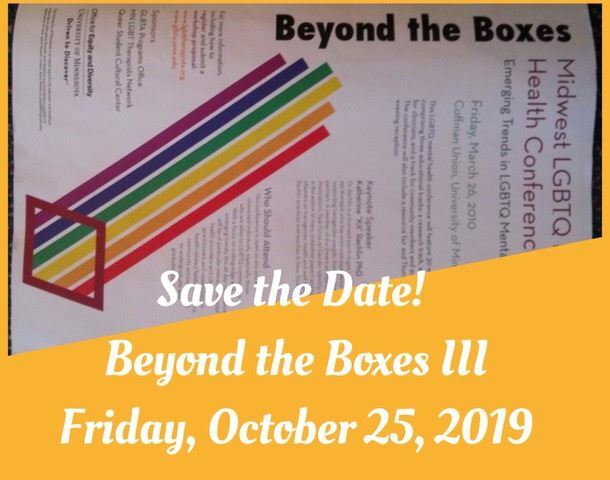 Beyond the Boxes III: MN LQBTQ+ Therapists Network Mental Health Conference: Friday, October 25, 2019!! If you are interested in volunteering on the Conference Planning Committee or the day of the Conference please email us at network@lgbttherapists.org. Planning meetings (8am Wednesday mornings) will begin in early 2019. Watch the eNewsletter and our Facebook page https://www.facebook.com/groups/688252144537812/ for more information.